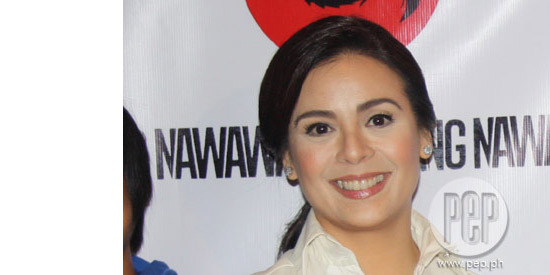 Dawn Zulueta has agreed to play a dysfunctional mother in the Cinemalaya entry Ang Nawawala. During the press conference of the movie held at the Dragon Bar in Quezon City this afternoon, July 10, Dawn talked about her indie film that also stars twins Dominic and Felix Roco. “I play the role of a mother with four children, two of which are twins [played by Dominic and Felix]. Merong tragedy na nangyari sa family and naging dysfunctional ako dahil sa loss ng isa sa kambal. "My character goes through a depression and becomes dysfunctional. Yung relationship ko with the family becomes estranged. This will mark the second time that she will appear in a Cinemalaya entry, after being part of Sigwa, where she played a former activist. How does she feel about competing against her Walang Hanggan co-star, Coco Martin, who is the star of the Cinemalaya entry Sta. Niña? “Pareho nga pala kaming nasa New Breed category… I will watch his film and he will watch mine. Support kami pareho sa isa’t isa!” she said with a laugh. Does she have any upcoming projects aside from Ang Nawawala and Walang Hanggan? She mentioned that her husband, Davao del Norte Congressman Anton Lagdameo, will be seeking reelection in the 2013 elections. Dawn is also very receptive to the idea of doing a movie with Richard Gomez. KISSING SCENE WITH RICHARD GOMEZ? Dawn’s loveteam with Richard Gomez is faring very well onscreen. In fact, their characters Emily and Marco are falling in love again with each other and almost ended up kissing each other. Will Dawn agree to do a kissing scene with her ex-boyfriend for the show? “Sa akin, bawal pa rin,” admitted Dawn. “Parang nakakahiya naman sa husband ko. And of course, for my children, for them to watch something like that on screen, hindi ko pa masyadong ma-explain sa kanila dahil bata pa.
What if it really becomes needed in the story? “I’ll cross the bridge when I get there,” said the actress of Walang Hanggan. What is Dawn’s reaction to Richard Gomez’s plan to run for mayor of Ormoc City in 2013. “I wish him all the best, although I’m sure the industry will miss him. I keep telling him, ‘Pag mayor ka, hindi ka na namin mapapakinabangan,’” she said with a smile. “Doon ka na lang sa Ormoc. At least, he’s doing service naman for the people, but I also think Richard is such a great actor, and I think the industry needs more like him. Is Dawn also open to the idea of running for public office? “Wala talagang chance…I never really entertained the thought. ON RITA AVILA. A few weeks ago, Rita Avila’s character was killed in the primetime series Walang Hanggan. This afternoon, Dawn clarified that Rita left the show for health reasons. “Ang alam ko, when I asked her about it, she said that she had a problem in her spine and she needed to do more therapy. Because of the hectic schedule of taping, she’s unable to do her therapy regularly. “From what I understood, she was coming to work in pain. Yun lang ang reason kung bakit umalis siya sa show,” Dawn said.